New Haven, a coastal city on the northern shore of Long Island Sound, is home to Yale University. The iconic places to run in New Haven include some coastal spots, the Yale campus, East Rock, pretty residential streets, and a section of the Farmington Canal Heritage Trail. There’s some great waterfront running as well. Though unfortunately cut off from central New Haven by the I-95/I-91 tangle, it’s wonderful once you’re there. Nice Streets & Neighborhoods. New Haven has some lovely streets with older Victorian homes and interesting architecture. 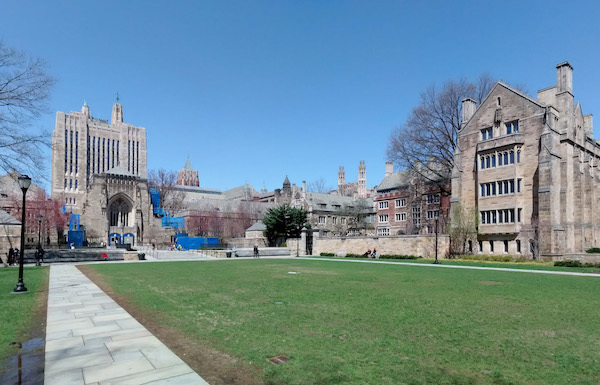 A really nice area includes some of the roads from the Yale Campus heading east: Whitney, Hillhouse, Orange, Temple, Prospect, and side streets. Edgewood Park. Lovely park with a trail that’s ~1 mile from end-to-end. About 1.2 miles from the Yale campus using Chapel St. or Edgewood Ave. A nice 4-5 miler! Long Wharf Dr. and Park has lovely waterfront running along a dedicated path, for 1.5 miles. Great views!